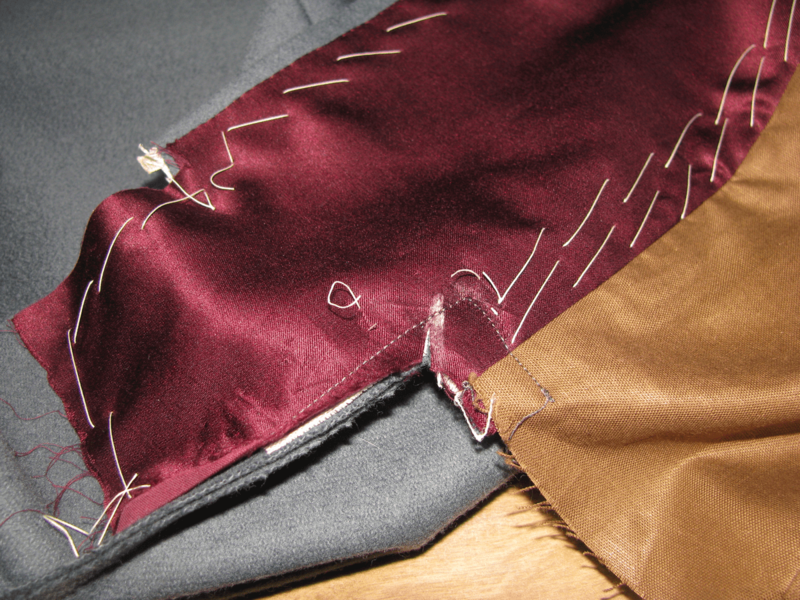 Plait or pleat pockets in a frock coat are often misunderstood, construction wise, and can be tricky to do correctly. Studying an original coat in my collection, I have reconstructed the methods of making these pockets, and share them for your edification. Your coat should be sewn together at the sidebody and forepart, and skirt seams. The back should not yet be attached before beginning. First, you’ll need to decide whether you want interior or exterior plait pockets. Exterior pockets are a lot easier to reach into, being accessible from the outside. However, you leave the pocket contents more available to pickpockets. On the other hand, interior pockets will protect your pocket’s contents from those bandits, but are a lot harder to get into. You’ll most likely want to take the coat off before accessing the pockets. Please note that this is an excerpt from my Double Breasted Frock Coat Workshop. If you enjoy this tutorial, please consider registering today, to gain access to almost 300 pages of step-by-step instruction. Drafting the plait pockets is the same for both interior and exterior pockets. 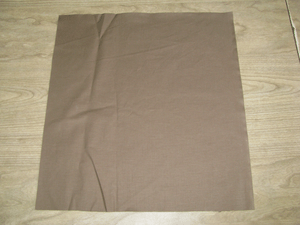 The only difference is that the interior pockets are cut on a fold, while the exterior pockets must be cut separate, with a seam allowance added. Begin by drawing a vertical line 16 inches long. At the bottom, square out another line 7 to 8 inches wide. These numbers are both variable according to how long your skirt is, and how large your coat is, but this is a good starting point. At the top, draw a line square across that is about 1/2″ smaller than the bottom width. Connect the two end points with another line. At the top, extend the first line about 1 inch, and redraw the top line at an angle. At the top and right sides, add curves to each. 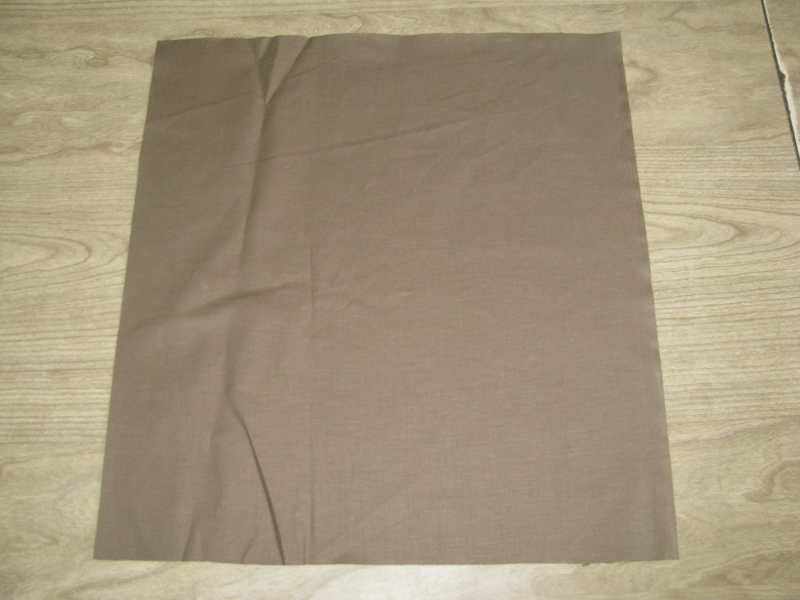 This will add fullness to the pockets, and allow them to hang freely without affecting the drape of the skirts. Again at the top, add a dart to the pattern. This should be about 1/3 away from the left construction line. The construction line of the dart comes down vertically about 4 inches. The total width is 1/2 inch. 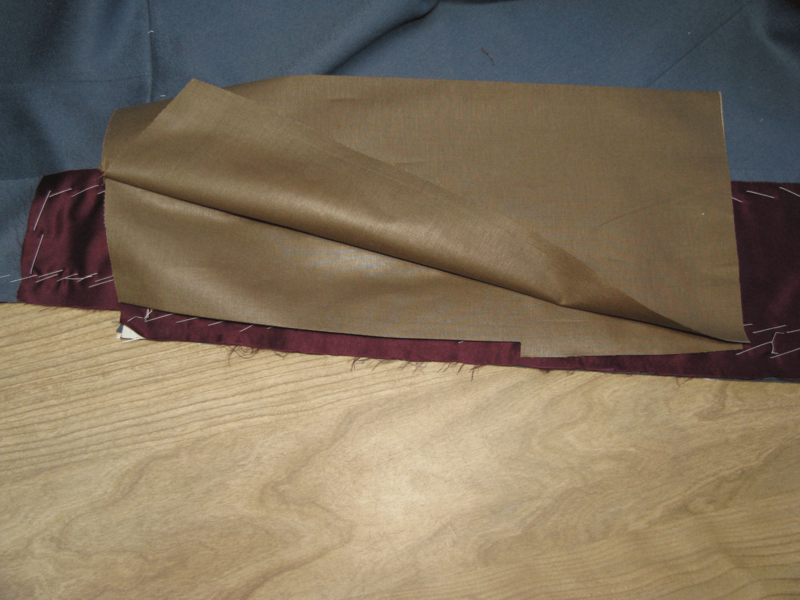 Finally, redraw the top seam so that the seams of the dart agree in length. 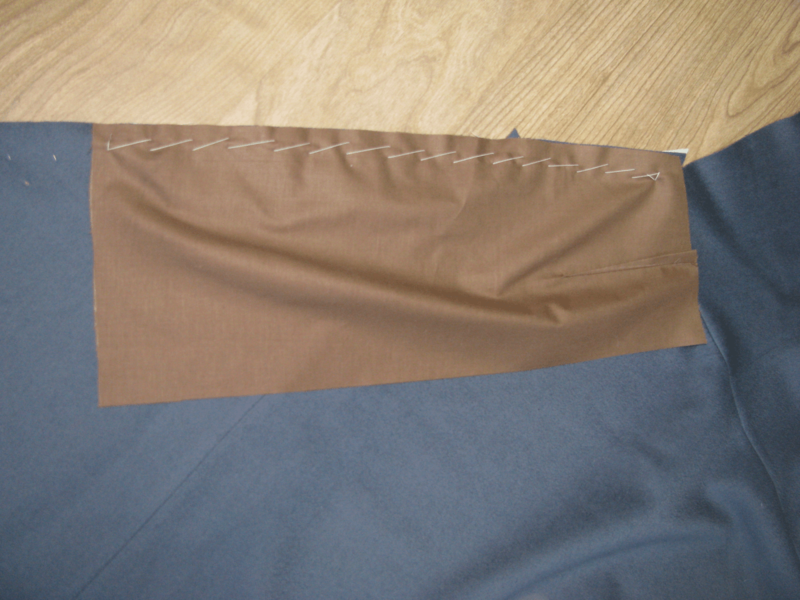 If you are doing an exterior pocket, add a 1/4 inch seam allowance on the left side. If doing an interior pocket, the original construction line will be placed on the fold when cutting out the pocketing fabric. We’ll begin with the construction of the exterior plait pockets. 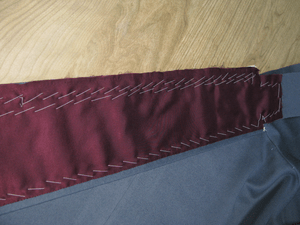 Skip this section if you are doing exterior pockets. Begin by cutting out two pieces of polished cotton for each pocket bag. 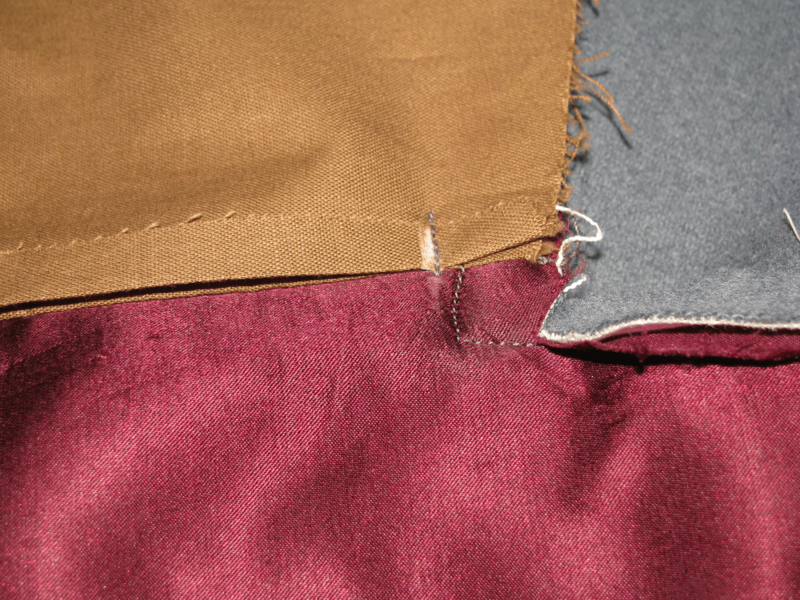 These are cut separate with the seam allowance you added when drafting. Make sure you mark the darts at the top in chalk, on both pieces. Baste each dart closed, then stitch. Press each dart to one side, and alternate the dart on the other half so that it is pressed in the other direction. This will help reduce bulk. 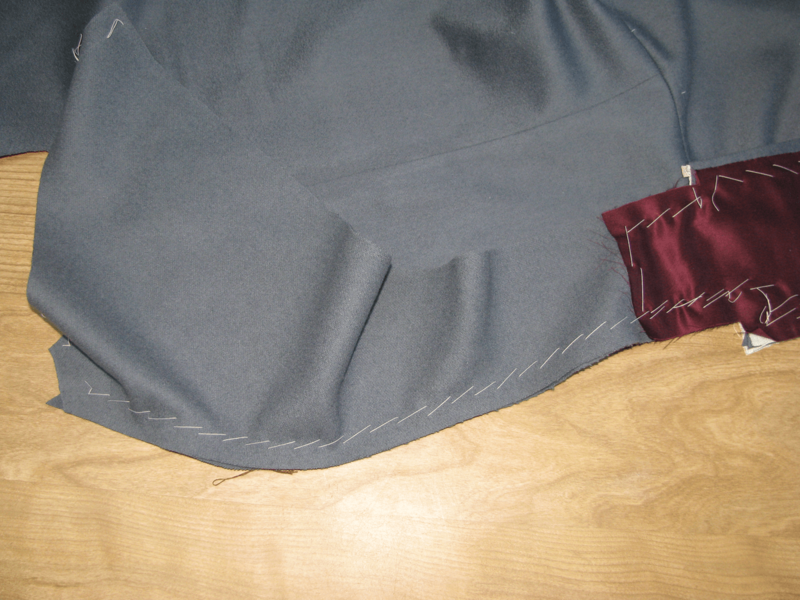 With right sides together, line the curved edge of the pocket up with the edge of the skirt, aligning each at the top. Baste firmly together. 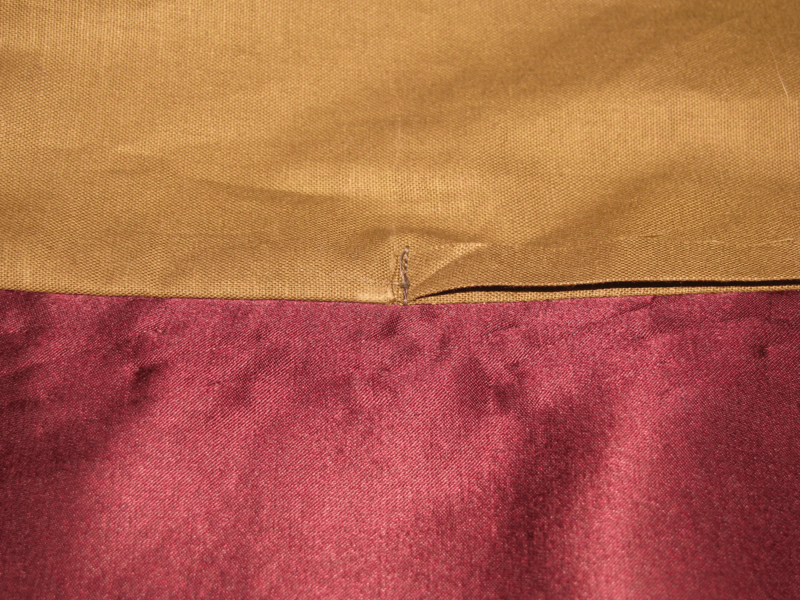 Sew the seam with a 3/16 inch seam allowance. 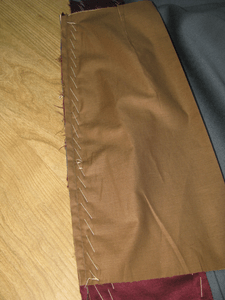 You want it to be slightly less than a quarter of an inch so that the seam will not be seen in the finished coat. 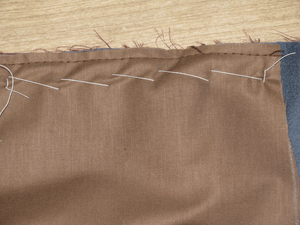 Remove the basting stitches and press open the pocket bag. 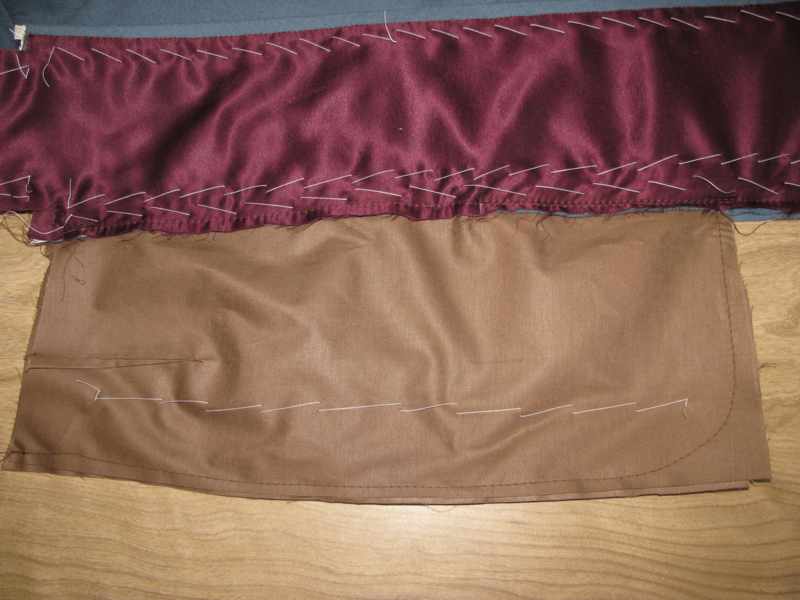 Do the same with the other half of the pocket bag, sewing it right sides to the unfinished edge of the back skirt, again aligning at the top. Press open as you did for the other half. Align the back and main skirts, right sides together, making sure that the pocket bags are lined up. Baste through all layers. It’s very important that the edges of the wool layers are perfectly lined up. It’s hard to tell, as you can’t see both at once, so you’ll need to rely on touch with your fingers. 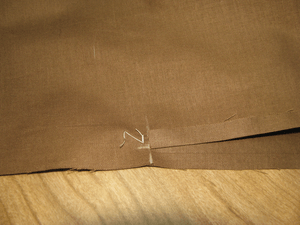 Mark on the edge of the back seam 1 inch down from the top of the pocket, and again, 9 inches from the top. 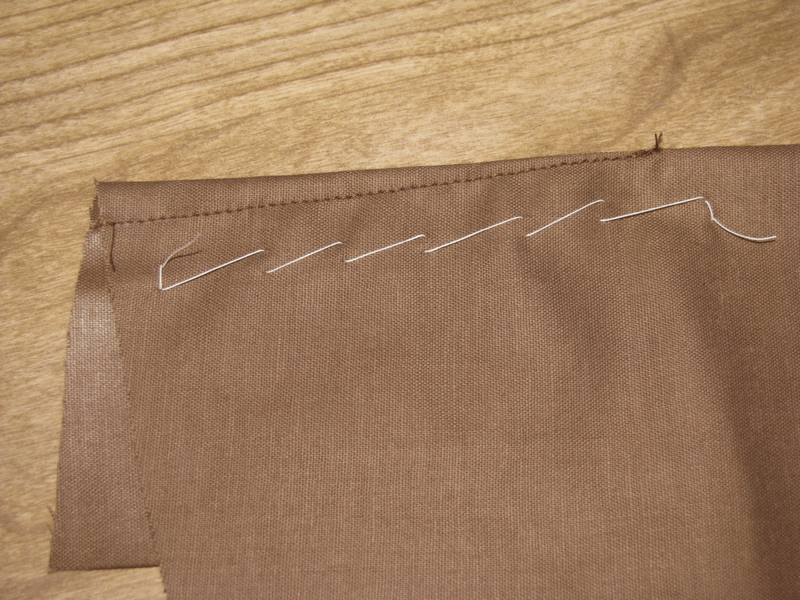 This marks the pocket opening, and where you do not want to sew (or else you’ll close up the pocket). 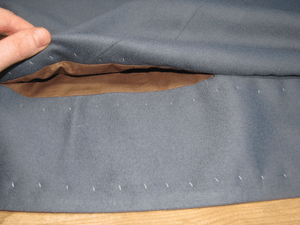 Sew the back seam as described in the section Interior Plait Pockets. 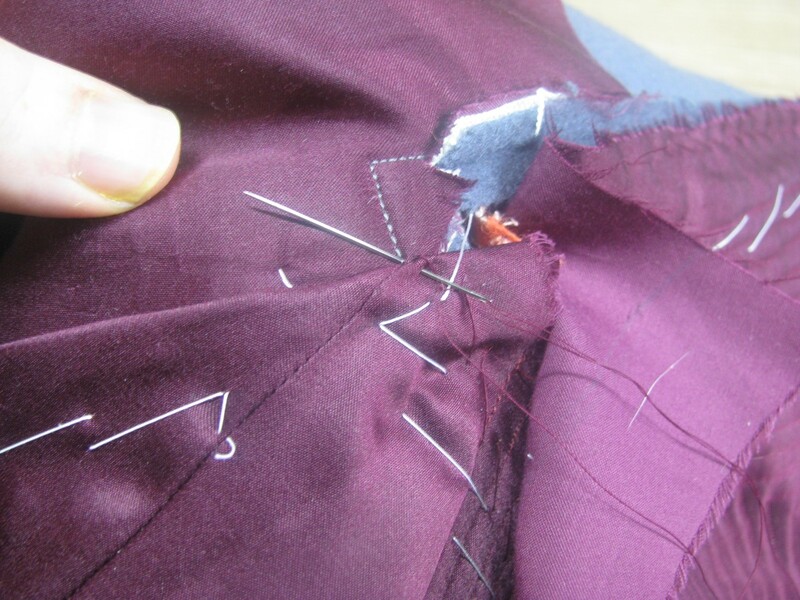 You’ll want to have side body seam basted to the upper back seam before proceeding. 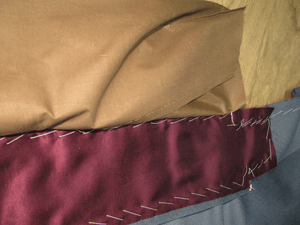 The only changes are that you use a 5/16 seam allowance, and stop sewing at the marks. Sew the seam from 1 inch from the bottom, to the bottom mark, and from the top mark, to the top at the waist seam. 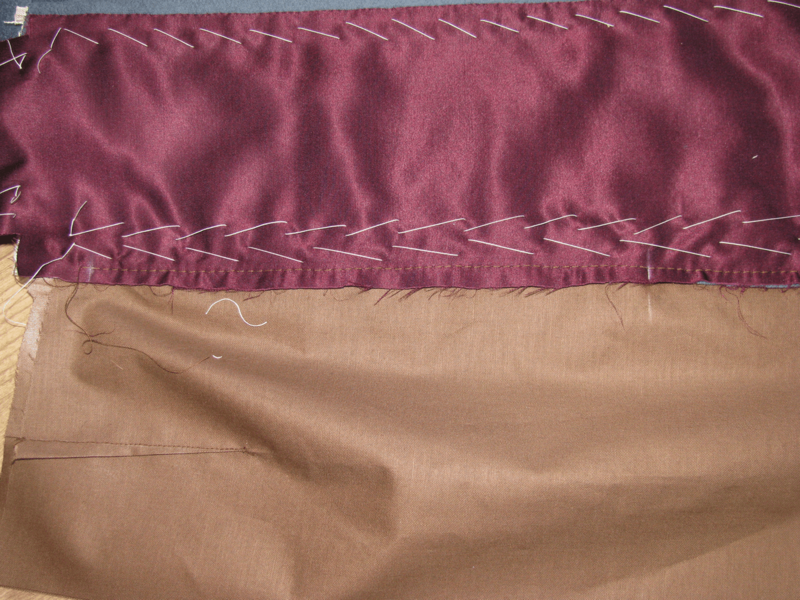 Next, baste the pocket halves together, and sew along the edge. 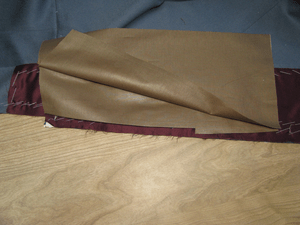 At the bottom outer corner, you should curve the seam nicely. 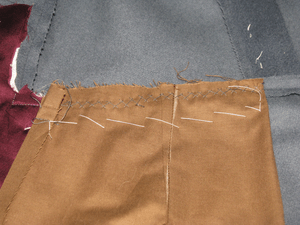 Sew from the top of the pocket all the way to the bottom, ending at the 5/16 seam on the wool body. 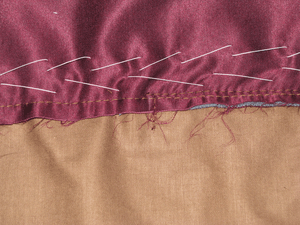 At both chalk marks indicating the top and bottom of the pocket mouth, tack each with a row of stitching. 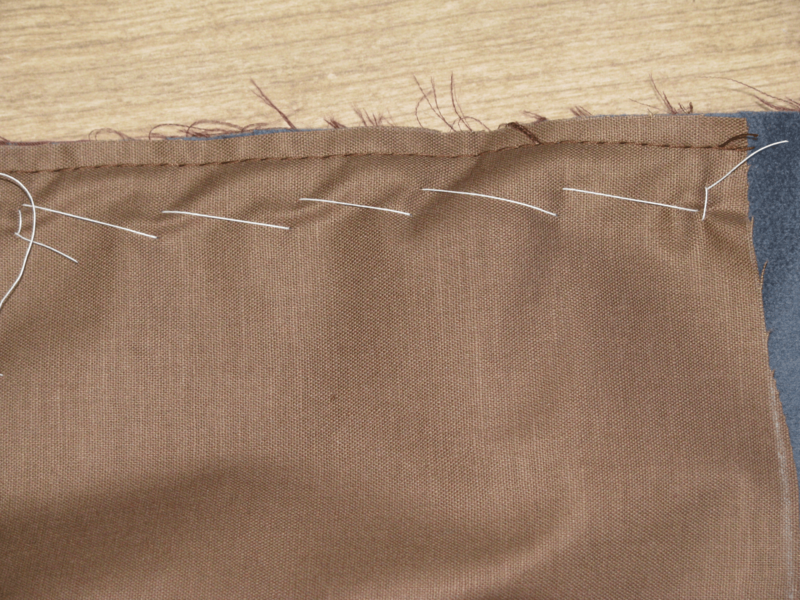 Start exactly at the seam line and ending just past the edge of the wool, on the pocket itself. This provides extra strength for the pocket, so that it doesn’t tear as you use it. At this point the pocket is complete, and just needs to be cross-stitched at the top, as explained in the last section. 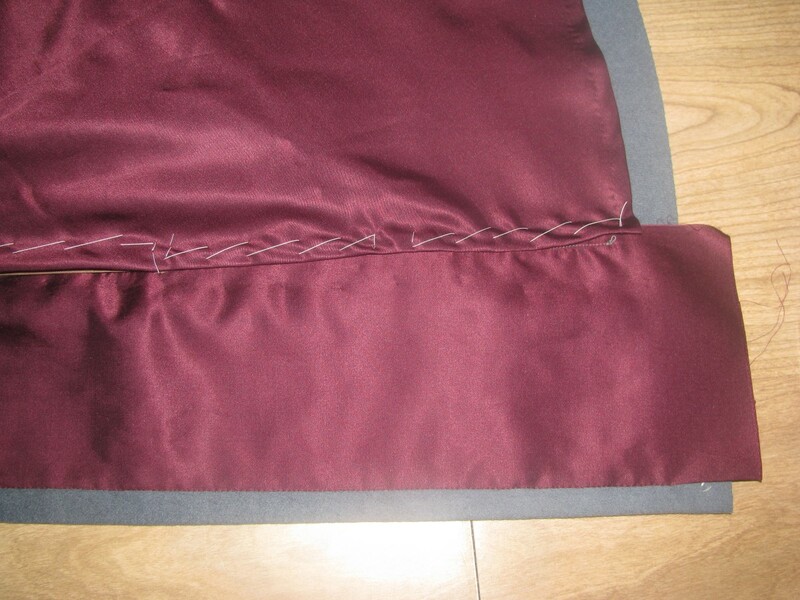 The interior plait pockets are a little more involved, construction wise. 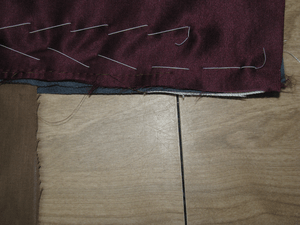 Follow these instructions for attaching the side body to the back if you are doing the exterior pockets, as well. 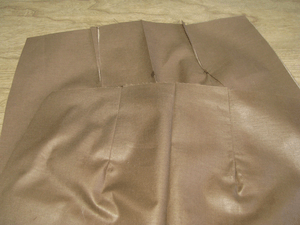 At the top, very carefully clip the skirt seam allowance, 3/16 inch from the edge of the center back seam. This will help reduce bulk in this area, as otherwise you can have 6 or 7 layers in this area, giving an unflattering look. Now baste the upper halves of the back piece and side body together. These seams must be eased together so that no ripples show on either side. The fullness will appear on one side or the other, depending how deeply you drafted the curves on these pieces. 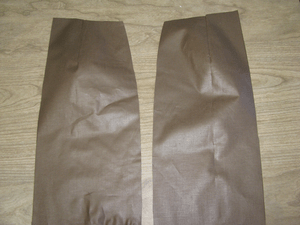 Then baste starting from the waist down to the bottom of the skirts. The following pertains to the interior pockets only. 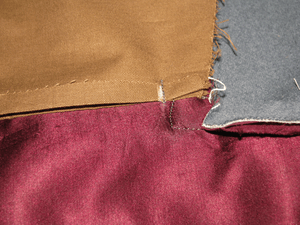 Cut a square of polished cotton twice as wide as the finished pocket pattern. 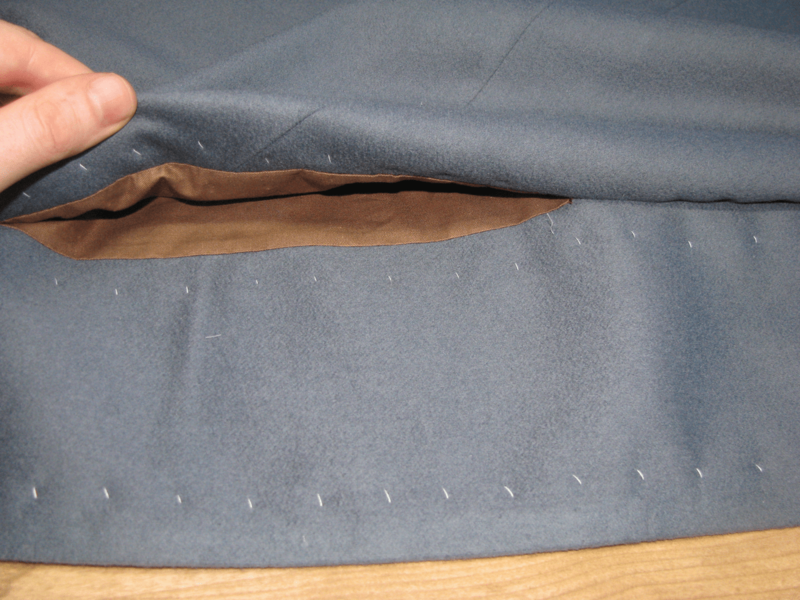 Press it in half, right sides together, place your pattern along the fold, and form the darts on both sides, as explained in the exterior pocket section. You’ll end up with two darts in each pocket, pressed in opposite directions. Also be sure to mark the curved edges. 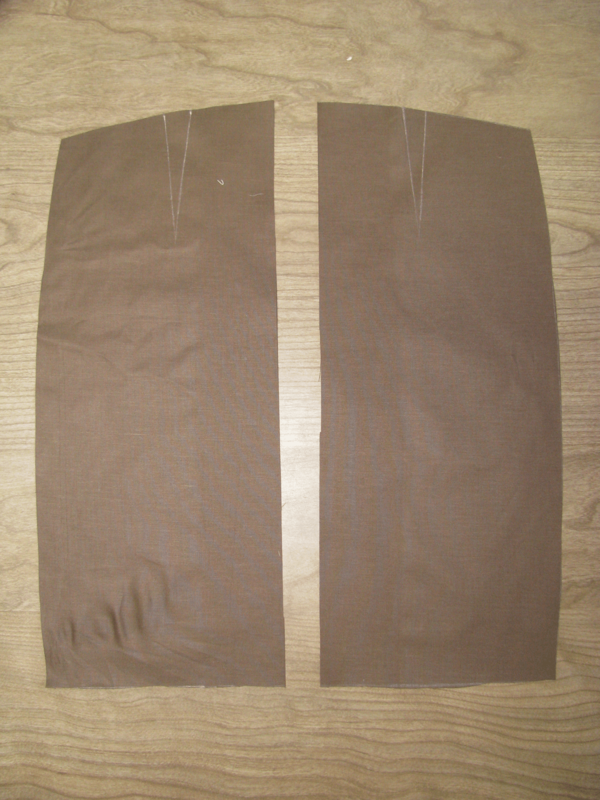 Mark on each pocket halve, 9 inches down for the length of the pocket opening. Make a cut in one half of the pocket only at this point, ¼ inch deep. 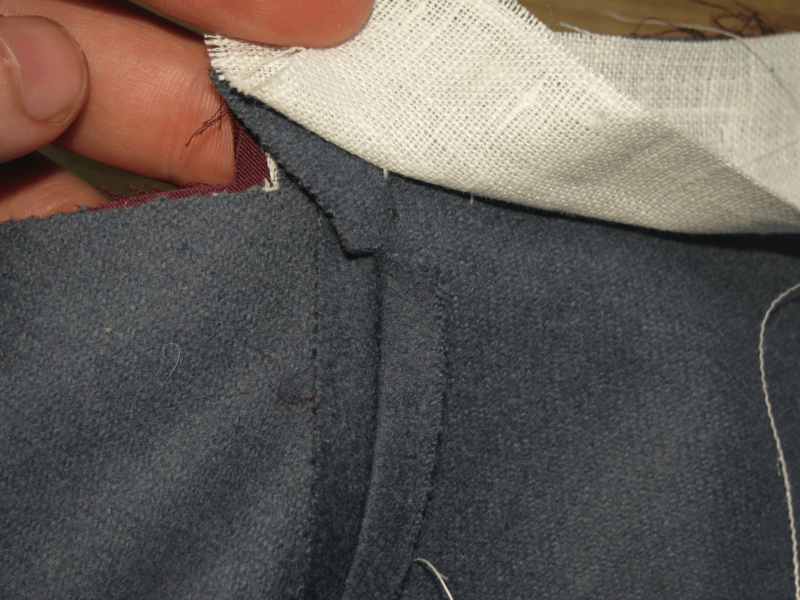 Press the seam allowance from this point to the top of the pocket back towards the wrong side. Repeat for the other pocket half, being sure to do the opposite. 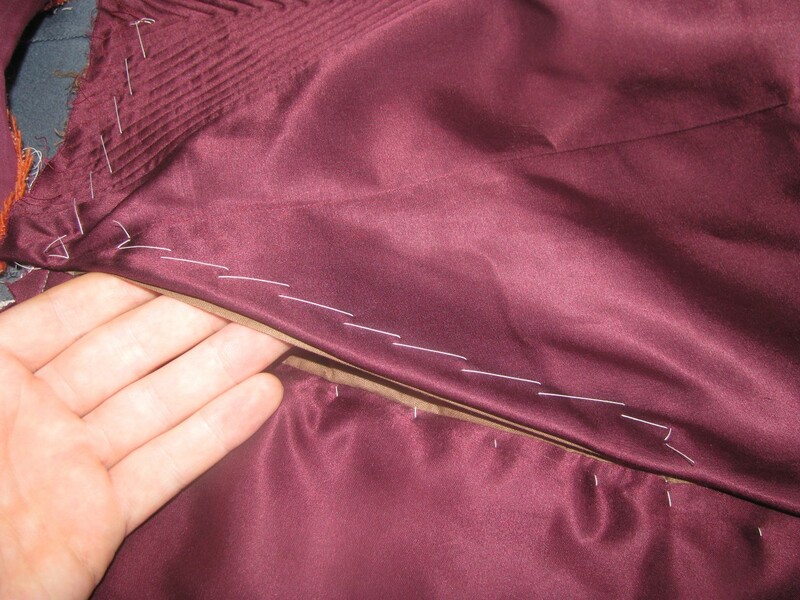 After pressing, tack the edges together by hand just below the cut, and all the way down to the bottom of the pocket. Place one half of the coat right side down, and arrange it so that the back piece is facing wrong side up on top of the coat. Place the pocket with the cut edge down onto the skirt assembly. 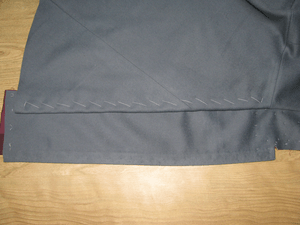 The raw edges of the pocket should be aligned with the edges of the back skirt. Baste the pocket down, working the curve of the pocket into a straight line. 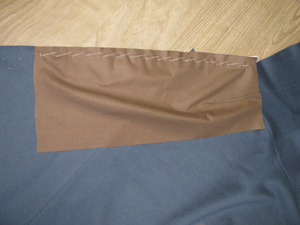 When basting the upper half of the pocket, above the cut, you want to move the bottom half of the pocket out of the way, so that it is not caught in the stitching. You can flip the pocket over to make that this is the case. 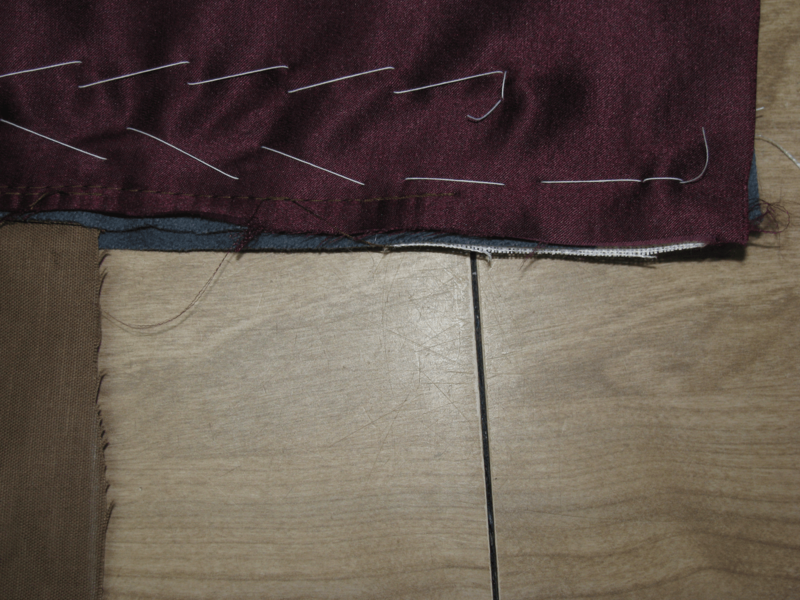 Now sew a straight seam, starting from 1 inch from the bottom of the skirt, to the top of the ‘step’. 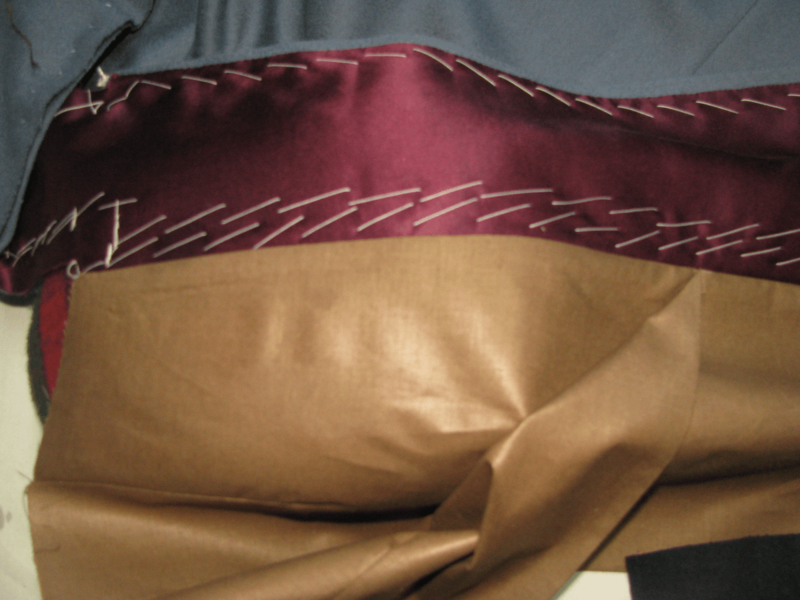 This will bind all layers together, except for the upper half of the lower pocket layer, which you moved out of the way. 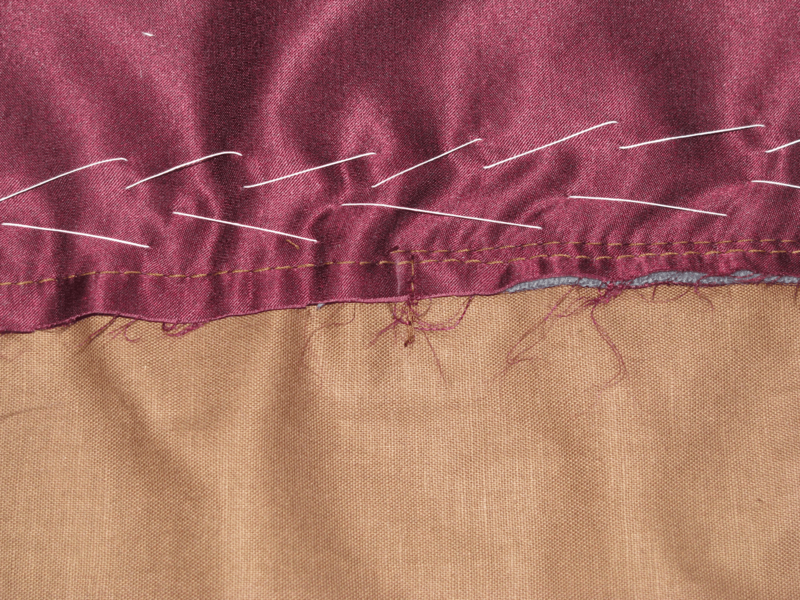 Remove the basting stitches from the pocket, and press the seam flat to set the stitches. You can see how the now upper half of the pocket is still free to open. Press the pocket back over a curved ham. 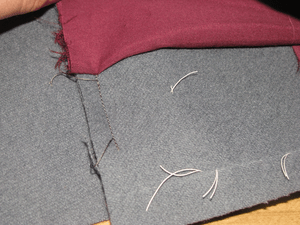 The pocket has some shape to it due to the curved seam, so a ham is necessary. 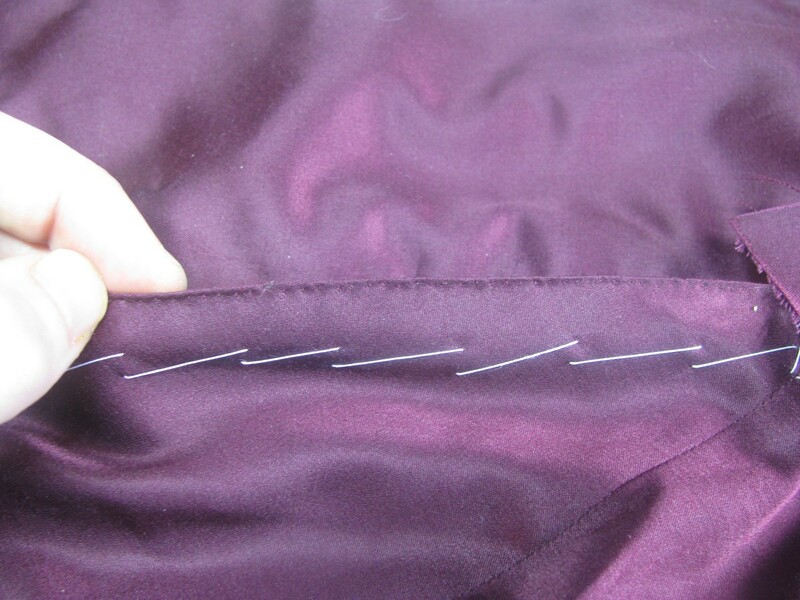 Sew a tack 9 inches below the top of the pocket, just above the chalk mark you made. The tack should be just above where the cut was made, and extends from the edge of the pocket, to 1/8 away from the wool. Make another tack at the top, about half an inch from the top. Pull the pocket slightly tight to reduce gaping in the finished pocket. These tacks are made while the pocket is still in position after pressing open. 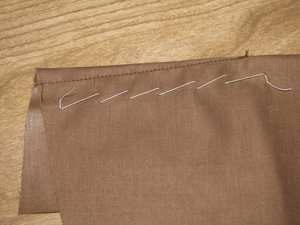 Sew the pocket closed along the bottom edge, giving a slight curve to the stitches to make it easier to retrieve items. 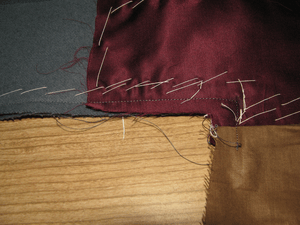 Sew the upper half of the side body to the back seam, making the little ‘step’ near the waist, and ending at the pocket, sewing all the way to the edge of the wool underneath. 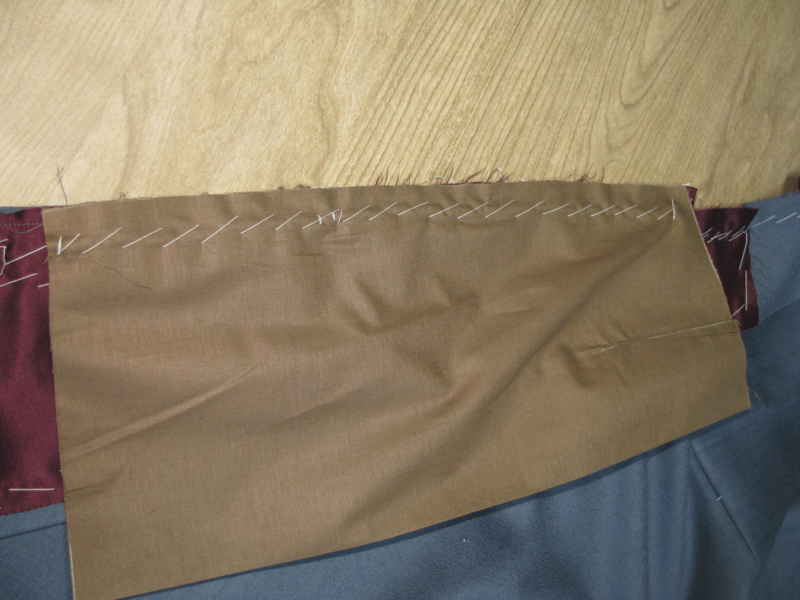 Near the bottom of this seam, near the waist, make a small clip in the back piece, almost to the seam allowance. 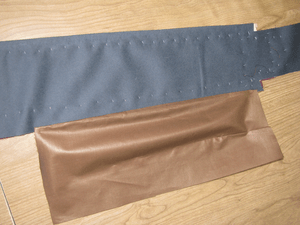 This will allow you to press the upper back seam open without issue. 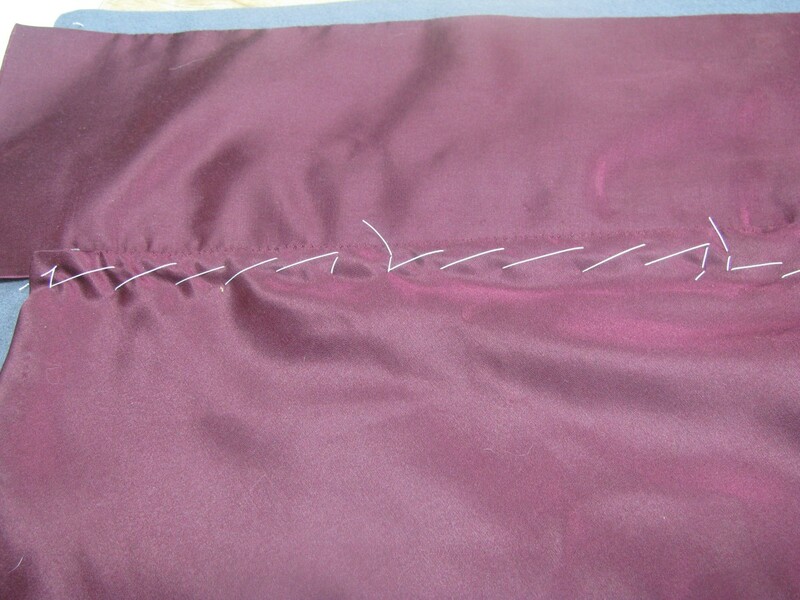 Press the upper back seam from both sides to set the stitches, then using a tailors ham, press the seam open. Be sure to press this on a curved surface, otherwise you will completely ruin the coat. 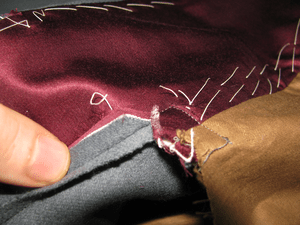 There is ease built into this seam, which if pressed on a flat surface, will disappear, giving you a very poorly fitted coat. 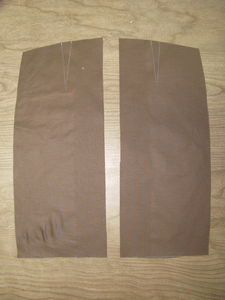 At the bottom one inch of the skirt, fold the lining out of the way, and sew the rest of the skirt closed. 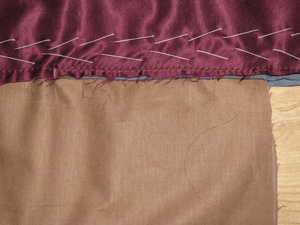 This will allow you to finish the lining more easily later on. Now turn the coat to the right side, and baste the pleat closed. If you want a pressed pleat, now is the time to give it a good pressing over a ham. I have chose not to press mine, and will instead leave it to hang freely. Turn to the inside of the coat, and baste the pocket across the top, just below the waist seam. You want the pocket to hang without affecting the drape of the skirts, hence the angled cut of the pocket tops. 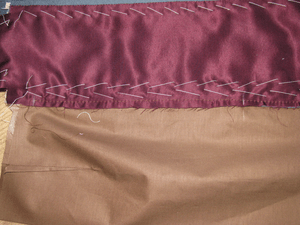 Cross stitch the pockets to the waist seam, being sure not to let the stitches show through to the right side. 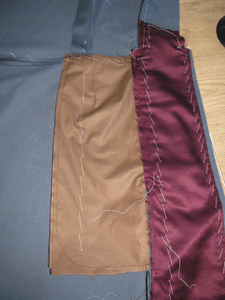 At this point, the pockets are completed, and you should remove all basting stitches from the pockets and the back lining, except for the outer edge near the waist that has not been sewn yet. 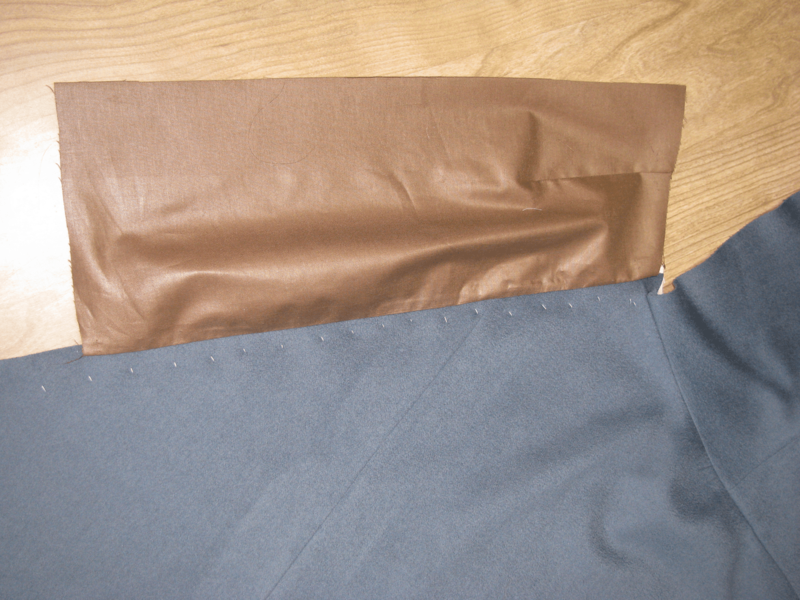 If you constructed exterior pleat pockets, the lining is simply basted under along the back seam, and felled down. The following instructions pertain to the interior pleat pockets. 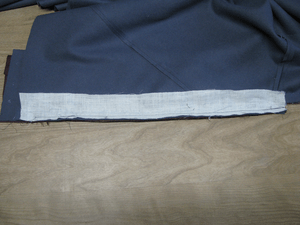 Fold under the back edge of the skirt lining, so that it overhangs the pocket by 1/8 of an inch. Baste carefully to the pocket, being sure not to accidentally close it up. 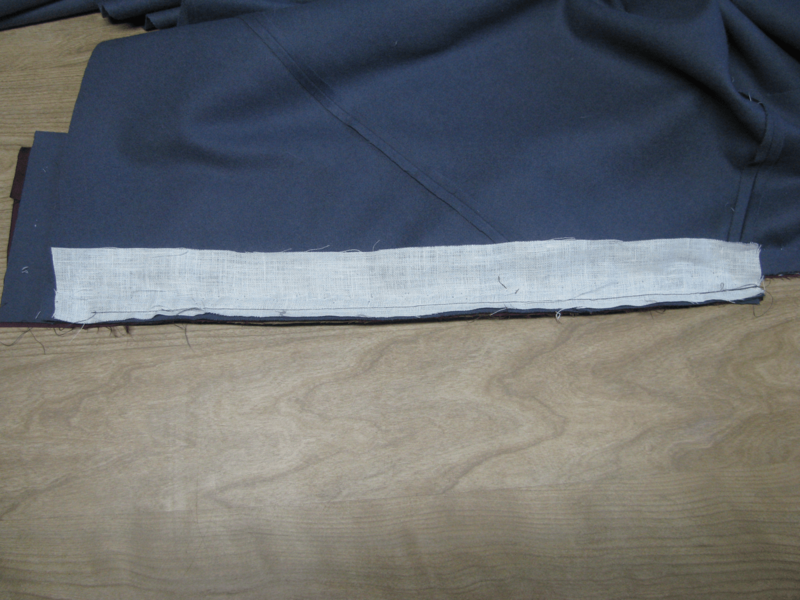 Baste the rest of the back lining down. 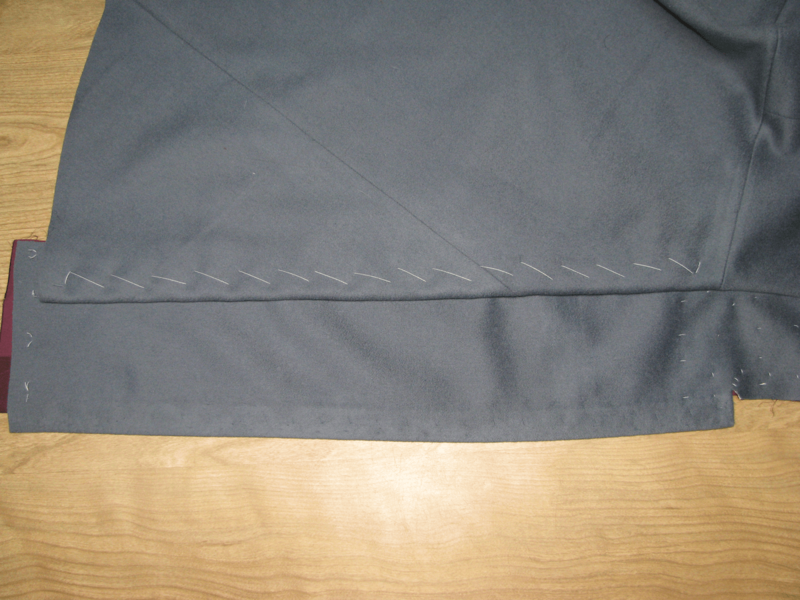 At this point, you should lightly press the skirt lining at all folded edges. At the back of the skirt lining, starting at the top, fell down the top half inch or so of lining, until you get to the top of the pocket. 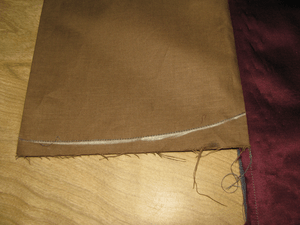 Use a side stitch to secure the lining to the top pocket bag. At the bottom of the pocket, continue felling until about two inches from the bottom of the skirt. This area will need to be finished later. Please note that this is an excerpt from my Double Breasted Frock Coat Workshop. If you enjoy this tutorial, please consider registering today, to gain access to almost 300 pages of step-by-step instruction. If you have any questions regarding this tutorial, please post at my support forum. Thank you!